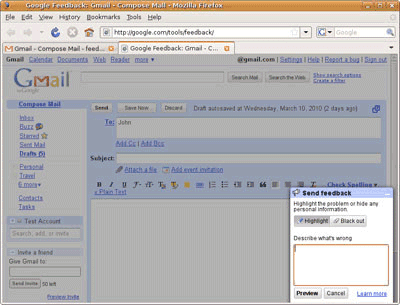 Google developed an extension for Chrome, Firefox and Internet Explorer that lets you send feedback about Google services. For now, the extension can only be used if you get an invitation from Google and it's limited to Gmail. 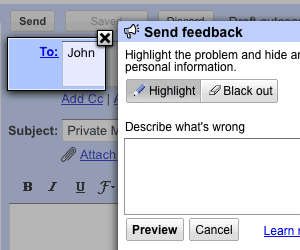 Google Feedback lets you highlight the parts of the page corresponding to your feedback, hide personal information, describe the issue and send your feedback. The extension is useful because you can send Google an annotated screenshot that illustrates your problem without using an image editing software. To get an invitation, go to this page and enter your Gmail address. Wow, a Hardy holdout. Personally I don't blame you, it just went downhill from there. Seriously, this is a cool addition by Google. If I manage to snag an invite, the lack of showing the subject line on reply is the first item on my feedback list. 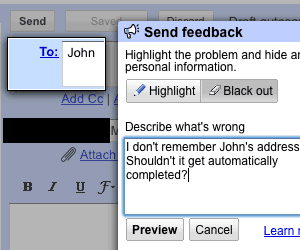 For anyone trying the Office 2010 Beta, Microsoft has similarly streamlined the feedback look. Hopefully the trend of simplified feedback is something more and more developers will embrace. its rather strange but i registered my interest in Google Feedback a week ago but i still get the message: "We're sorry, the service you requested is not active for the Google account you are logged into". I tried to use it and it doesn't work from IE8 on Windows7 x64. today i've got Google Feedback activation! first i noticed new link "Report a bug" in Gmail between "Help" and "Sign out", pressed it and than i was redirected to extension installation page. everything is ok, it works nice for Mozilla Firefox 3.5 and Google Chrome 5 on Windows XP SP3 32bit. Hi, we've just launched BugMucher - http://bugmuncher.com - which is a website feedback tool very similar to Google's. I'd love to hear what you all think. Hi, This OLD Post, very out of date. The extensions are not needed anymore to send feedback. Invitations are not needed and subscribing does nothing. Google has started a whole new way of relating to us, AND I HATE IT. LET ME decide if I need a new password, and who is or is NOT interfering with my account. Don't play DADDY and manage me. I am going to leave the use of all my Google accounts.